Mega! Kann ich nur empfehlen. 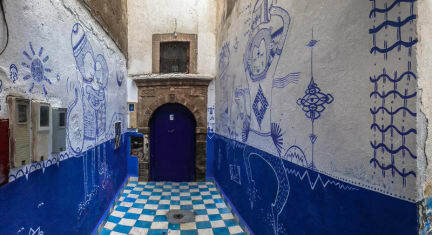 One of the best hostels during my 3 week morocco trip. The hostel is located perfectly in the center of the medina and it is very easy to find. Everything vas very clean and tidy. The chill area on the ground floor was super comfortable and very relaxed. Everyone there is super friendly. I met so many nice people there. 10/10 would definetely recommend this place! One of the best hostels we have ever been to. The staff is great and there is always someone around :) the rooms are spacious and super clean. We will definitely visit again! 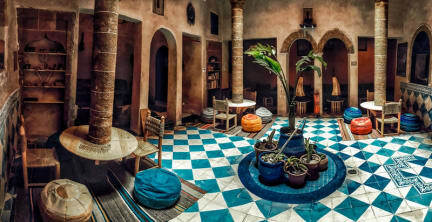 Such a great hostel in Essaouria especially for students!! I had such a great time! The staff was great and also all the facilities!! I really recommend the breakfast for 35 Dirham (3,50€ !!!) and also book the camel ride through them! It was amazing !! It would be a great place if it weren't for all the cats who are nasty enough to enter the dorms and have a nap on the button bunk bed! So if your allergic, choose another hostel or make sure to get a top bunk and teach your roomies to close the door properly! Apart from that it is clean, wifi works, it is well situated and the staff is nice, there is also a little kitchen with a free-food shelve. Das Appartment entspricht nicht dem restlichen Hostel. Für 37 € die Nacht kommt man in einen Riad deutlich besser davon. Es war nicht sauber, die Küchenausstattung war mangelhaft, es lag ein stark modriger Geruch in der Luft und zwei kleine Fenster für das ganze Appartment machen das ganze zu einer dunklen Angelegenheit. Die Dachterasse war leider auch nicht gepflegt ausgestattet. Die Dorms sahen da deutlich besser aus.